Ovation at Oak Tree is a new community being built in Lacey, Washington by William Lyon Homes. This 55+ community is located in Thurston County, which is 20 minutes east of Olympia. With two separate clubhouses planned and a 40-acre nature preserve in the community, residents of Ovation at Oak Tree will live a serene, relaxed lifestyle while never feeling too far away from all the conveniences of being located near a big city. 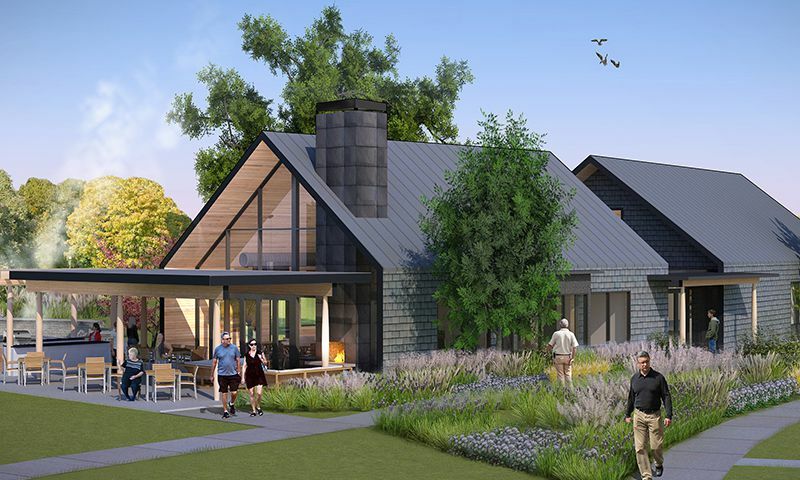 Ovation at Oak Tree will feature two separate clubhouses for residents to enjoy. The first clubhouse is the 4,500 square-foot clubhouse, The Pavilion. It includes a gathering room to meet with friends and family as well as a catering kitchen perfect for preparing snacks for a party. There are locker rooms for changing into your gym clothes so you can make use of the exercise room in the clubhouse. A patio with outdoor kitchen is also available to use, with a community fire ring to meet around at the end of an exciting day. The second clubhouse to be completed will be the 13,000 square-foot clubhouse, The Village Club. There, residents will enjoy a large gathering room with lounge seating for relaxing with friends or sitting down to read a book. There will be a game room for board games or cards and a large gathering hall with a catering kitchen. A yoga and dance studio will be available for those looking to stay fit, as well as a fitness studio. There will be locker rooms with changing areas so you can put on your swimsuit before going to enjoy the heated indoor swimming pool. Outside The Village Club will be a sundeck with lounge chairs next to a covered patio with an outdoor kitchen. There will also be sports courts for residents to play their neighbors in exciting games. Also included around the community will be a family picnic park with a large gazebo and BBQ station. There will be a recreation lawn for parties and events. Throughout the community will be many walking paths with landscaped pocket parks, including seating and a bird watching area with a platform. There will be many serene parks and natural spaces for residents to use to get out and enjoy the fresh air. William Lyon Homes began construction on Ovation at Oak Tree in 2017. The community will offer six different floor plans consisting of single-family homes ranging in size from 1,432 to 2,190 square feet. They will include two or three bedrooms, two or two-and-a-half bathrooms, and attached two-car garages. All of the homes come standard with modern features like gas line hook-ups for outdoor grills, Wi-Fi enabled thermostats and garage door openers, low-maintenance fiber cement siding, and more. Residents of Ovation at Oak Tree will love the low-maintenance lifestyle this community affords them. They’ll be able to make friends in the intimate, relaxed setting of the community at one of the two clubhouses, enjoying holiday parties, yoga classes, and walking the miles of trails in the community. At Ovation at Oak Tree residents spend less time worrying about home maintenance and more time enjoying the company of family and friends. Homeowners will pick up new hobbies and plan fun activities indoors and out, taking advantage of the 40-acre nature preserve with birdwatching and wildlife observation stations and trails. Located just 20 minutes east of downtown Olympia, Washington, Ovation at Oak Tree provides an envious setting of intimate natural surroundings while remaining close to big-city entertainment and convenience. Capital Mall is just a 22-minute drive away and includes over 90 restaurants and retailers. There are many natural spaces around the city like Heritage Park and Capitol Lake Park near the Budd Inlet. Closer to home, there is a Safeway just seven minutes from your door for all your daily needs. Just 18 minutes from Ovation at Oak Tree you’ll be able to access Providence St. Peter Hospital. Being located just a ten-minute drive from Interstate 5 means getting around to other parts of Washington is a breeze. When traveling farther is necessary, Olympia Regional Airport can be reached in just 20 minutes. Just outside of Olympia, Washington, Ovation at Oak Tree is perfectly situated near shopping, entertainment, and dining in Lacey, Washington. The Village Club - 13,000 Sq. Ft. - Coming Soon! The Pavilion - 4,500 Sq. Ft. There are plenty of activities available in Ovation at Oak Tree. Here is a sample of some of the clubs, activities and classes offered here. 55places.com is not affiliated with the developer(s) or homeowners association of Ovation at Oak Tree. The information you submit is distributed to a 55places.com Partner Agent, who is a licensed real estate agent. The information regarding Ovation at Oak Tree has not been verified or approved by the developer or homeowners association. Please verify all information prior to purchasing. 55places.com is not responsible for any errors regarding the information displayed on this website.